Can I build a farm jeep using my Wrangler? I have a 1994 jeep wrangler 4cyl. Surprisingly tough little jeep, and super strong in 4lo. Have wondered if there would be any way to adapt it to cultivate my modest agricultural land. Plow, rake, till, drag, mow, level, etc. Sort of a medium duty tractor substitute. We have been asked similar questions many times. This is really out of our knowledge zone. But that doesn’t keep us from offering advice. That advice would be to buy a compact utility tractor if you plan on doing anything other than using pull-type implements. The original design of the argri-jeeps and the early CJ version didn’t include a hydraulic lift. They assumed that the small farmer, their target market, would use the implements they had on hand and had used with draft animals. After WWII there were still many farms with 40 acres and two mules. I won’t go into agricultural history, but just say that it is safe to say that any modern jeep can be used as a tractor when using these old pull and ground driven implements. In fact I know that many people are using their jeeps this way today. Denny’s note got us thinking about how we might equip a modern jeep to do tractor work. Basically, that would mean adding a lift and PTO. After some searching, we came across this T-Point-Lift-Vehicle-SUV-UTV-3-Point-Hitch that appeared to be a quick solution for the 3 point hitch, We attempted to contact the company via email to see if any of their customers might be jeep owners, but never received a response. The search for a PTO solution was not successful, We were assuming we would need to find a hydraulic rather than a mechanical PTO. We assume a unit could be fabricated, but did not find a ready-made device. We did find a number of videos showing modern jeeps towing pull type implements, including this comparison Farming with a 1953 Willys CJ3a and 2013 Jeep Wrangler Unlimited. Summer tractor and jeep shows got in our way and we left doing more to answer the question for another day. After seeing the note on the the Early CJ forum (in this case a 1971 CJ5) we decided it was time to revisit the question. Barry responded to the post saying that he would invest in a Ford 8N or similar tractor for the lift and PTO work the poster wanted to be able to do. The jeep is still invaluable for hauling and towing. An 8N can be found for between $2K-$3K, often with a mower (one of the posters tasks). The above mentioned T-Point Lift was on sale for $1530, but would not provide for the PTO. The 8N and similar model tractors were the chief competitors of the Farm Jeep and, like the jeep, are easy to work on and parts are readily available. So did we answer the question? Sort of. 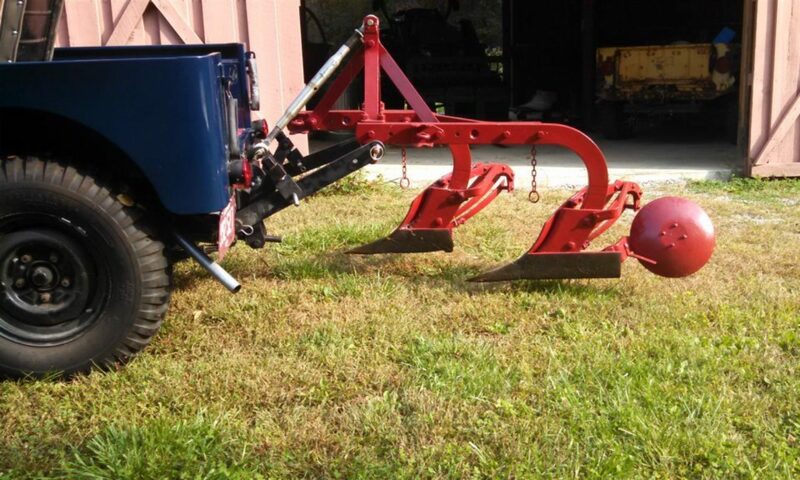 You can use any jeep to pull implements and with something like the T-Point Lift you could use any modern 3 point implement not requiring a PTO. But without the PTO we don’t believe it wouldn’t be a farm jeep in the traditional meaning.. There is, as Evan often says, a reason the Farm Jeep isn’t still around. The truth is it isn’t a very good tractor. The turning radius makes it hard to use in small fields. You can’t see the implement from the driver’s seat the way you can on a tractor. For the farmer of limited means, the farm jeep was a good enough tractor and much better than draft animals. For the non-field work, a jeep. old or new, is a great farm tool. Most modern farmers have turned to UTVs for non-field work jobs. But in a jeep can still do things no UTV – or tractor – can do, such as driving into town for supplies. And you can use it as your daily driver. Get a Jeep! Next PostNext Spring Midwest Willys Reunion Coming to Farm Jeep’s Home Town!